HOUGHTON – Researchers from Michigan Technological University have released the annual Winter Study report detailing updates on the ecology of Isle Royale National Park. For the third year in a row, the Isle Royale wolf population remains a mere two, while the moose population continues to stay above the historic average. Without the pressure of predation, the expanding moose population will have a greater impact on the island’s forest ecology. The study co-authors include Research Professor Rolf Peterson, Professor John Vucetich and Assistant Research Professor Sarah Hoy. They say the heart of the study’s success has been the more than 1,000 citizen science volunteers who have bolstered the study’s fieldwork efforts in small teams totaling about 40 people each year for the last 30 years. Together, they helped gather enough skulls to document the shrinking moose of Isle Royale, observe seasonal wolf activity and earned more than their fair share of hiking boot blisters. The pair are closely related – both as siblings and as father-daughter – and the inbreeding within the island’s isolated wolf population is what contributed to their demise. The wolves’ numbers started plummeting in 2009, declining by 88 percent from 24 to 2 wolves for that period; historical levels of wolves typically varied between 18 and 27. The pair, aged 8 and 10 years old, may have produced a pup several years ago but the female has continued to reject the male as a mate. One meager hope for new wolves formed briefly in early February. For almost a week, an ice bridge connected the island to the Ontario mainland. However, the ice conditions were rough, the bridge did not last long, and the researchers found no evidence of wolves crossing over. 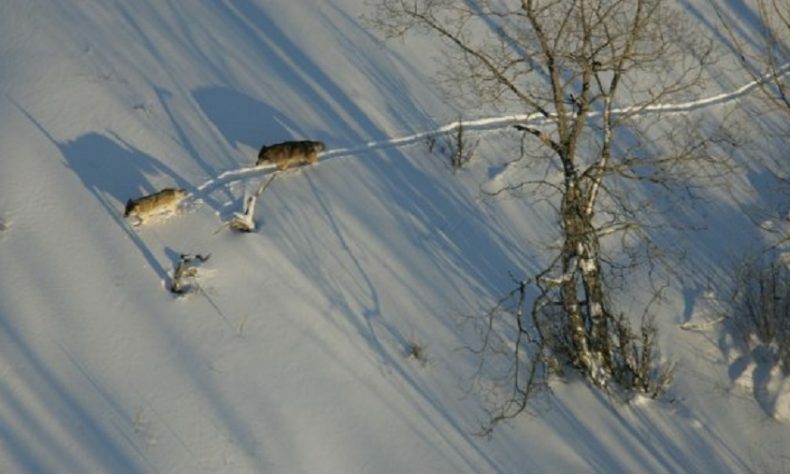 With fewer ice bridges and warmer winters, the chances of wolves recovering naturally is slim. As the wolf population declined and forage remained abundant, the moose population has been able to expand. Counting conditions for the past two winters have not been ideal, but the team estimates the moose population to be around 1,475 members. The population usually numbers between 700 and 1,200 moose. Hoy, who led the skull size study of the island’s moose that found their size decreased by 16 percent over 40 years, says we are observing a population in transition. Peterson, who has been a part of the Isle Royale research for the past 50 years, says the island is a unique place to study moose and wolves. Unlike big, complex spaces like Yellowstone National Park, where the cascading effects of wolf populations are still debated among scientists, Isle Royale is a neatly contained ecosystem that can provide insight into other north woods settings. The National Park Service has proposed introducing 20 to 30 wolves to the island over the next three years. The final environmental impact statement was completed and the identified preferred alternative is to restore wolf predation, but the final decision on the plan is pending as of the Winter Study report publication. Many of the project’s discoveries are documented at www.isleroyalewolf.org.